Warehouses around the country are struggling with labor shortages at a time when productivity demands have been increasing for years. It can seem like an impossible task to figure out how to get more out of your workforce when you can’t hire enough additional resources to scale up your operations. But this is where technology can play a crucial role, and one recent innovation is helping address the labor shortage by enabling 14% more productivity per worker and revolutionizing the way warehouses get things done. Zebra’s TC8000 touch computer has been on the market for over a year now, and it’s been making waves by making barcode scanning processes faster and more efficient, while also simplifying workflows and increasing the speed and accuracy of data entry with touch computing. The TC8000 is different by design, and its departure from the traditional gun-style scanner and mobile computer combo is apparent as soon as you see it. It’s a lightweight yet rugged Android mobile device that combines barcode scanning and mobile computing in a tilt-free, ergonomic design. Zebra’s engineers placed a 4-inch hi-res WVGA screen on top of the device’s handle, so the display is visible as scanning occurs. Workers don’t have to tilt the device to read the screen and verify results after each scan. They just pull the trigger and see the results on the screen. This efficient scanning process reduces repetitive motion by 55% and has enabled 14% more productivity per worker per shift in controlled tests. 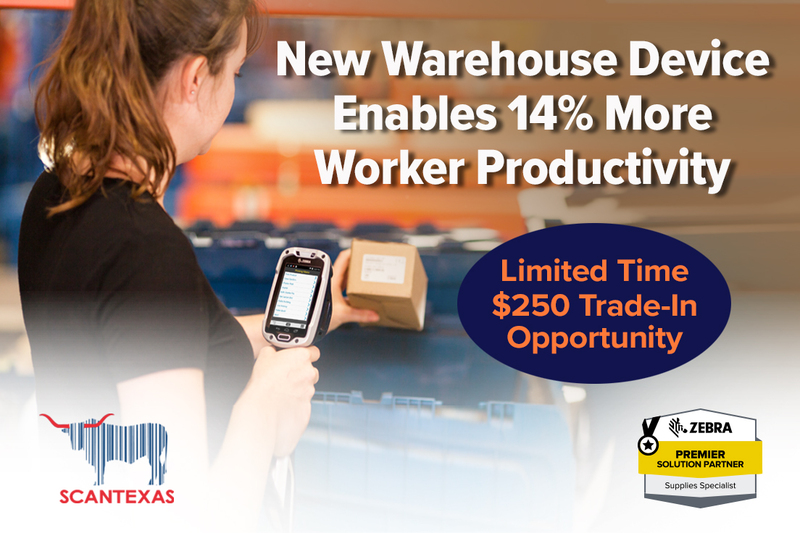 It’s a total of one full hour of added productivity per shift—ideal for warehouses feeling the pressure from labor shortages and increased productivity demands. Zebra even put the battery in the handle to ensure the device is lightweight and ergonomically balanced, and battery power lasts up to three shifts of power on a single charge. It’s also hot-swappable, so you can swap out the battery and keep the device running indefinitely. The Android interface makes it easy to tap and launch business apps and navigate through workflows and menus with the touch of a finger. The TC8000 also comes with eight customizable virtual keyboards that allows workers to enter data 40% faster with 60% fewer errors. In addition to these increased productivity efficiencies, the simplicity of the Android touch interface and its familiarity to many workers makes it faster to onboard and train new workers, which is vital when skilled labor is in such high demand. Advanced scanning engines ensure that workers can capture 1D and 2D barcodes flawlessly, on the first attempt, even if barcodes are damaged, scratched, smudged, poorly printed, or located under shrink-wrap. An optional camera also enables seamless video and photo capture to validate products or document conditions, and Zebra’s Workforce Connect also enables the TC8000 to be used as a push-to-talk device. You can convert your legacy terminal “green screens” into beautiful all-touch screens within hours, using the TC8000 and Zebra’s All-Touch Terminal Emulation (TE). Many warehouses are now making the switch to the TC8000 and taking advantage of these features to achieve more productivity and minimize their need to hire more labor during a significant labor shortage. If you’re facing the same challenges, we highly recommend the TC8000 and are happy to provide more information and a device demonstration. For a limited time, you can also trade in your qualifying mobile computers—including non-Zebra hardware—and get a rebate of $250 per device when you upgrade to the TC8000. Contact our team at ScanTexas to learn more and get started.